Should Atascadero police officers sport visible tattoos? Several months ago, an Atascadero officer asked the city to amend its tattoo policy. At the end of the two month trial period (September and October), the department will consider changing its tattoo policy. During the trial period, the department will continue to ban officers from showing tattoos on their hands, face, and head or from displaying offensive tattoos. Chief Jerel Haley wants to show an effort to be “progressive and keep pace with our culture, as tattoos have become such a large part of today’s society.” Harley is asking people to give feedback about officer tattoos on the department’s Facebook page. I don’t like the idea of visible tattoos. We provide our police officers with uniforns to create a professional appearance and visible tattoos detract from that, as do long hair, bushy facial hair and too much jewelry. Most police departments have a policy on grooming standards to keep their officers from looking like the people thay are supposed to protect us from. I do agree with comments about the buzz cuts officer are sporting these days. I always figured they were hiding their male pattern baldness, but it does make them look like they are going to be goosestepping back to their police cars after they handle your call for service. What’s next, pony tails, nose rings, ear rings? Role model for kids or homeys and gang bangers!!! 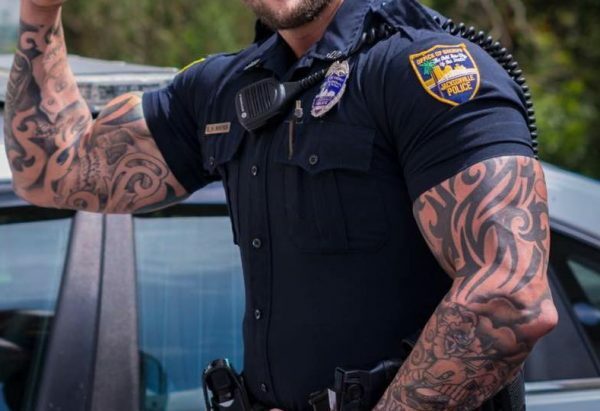 The buzz cut hair cuts are enough, that just about makes a good looking guy look like a thug and the tats would help that image along, the uniform and badge is something we were brought up to respect, I have no respect for a buzz cut and tats, that looks like a gangbanger. I don’t think tattoos should exclude men and women from service in the military or the police department. It is artistic expression. If the officer is qualified, passes background, and has good moral character, I could care less if he/she has tattoos. “Harley is asking people to give feedback about officer tattoos…….” little slip there ha ha. could extrapolate. that also, just not yet. We have passed the point of Tattoo’s being threatening. I am also of the baby Boomer generation and have now totally adapted to arm tattoos. Facial ones still bother me more from a point of view that that person does not have all their scruples and I may not want them doing things for me (food, repair etc). I will get past that also, just not yet. I know that things are changing although there are some occupations that should have respect for the uniform and the service it provides. i hope that strict guidelines are put in place as many of us old folks relate some of these tattoos to be gang related. and are not in good taste. I really don’t understand how you put a temporary policy in place for something that is permanent? Once in place it will always be there as future people will cry discrimination. I would hope that if approved that there are strict guidelines that they be covered up while on duty.